Starbucks is back at it in 2012, commemorating the Twelve Days of Christmas their way. 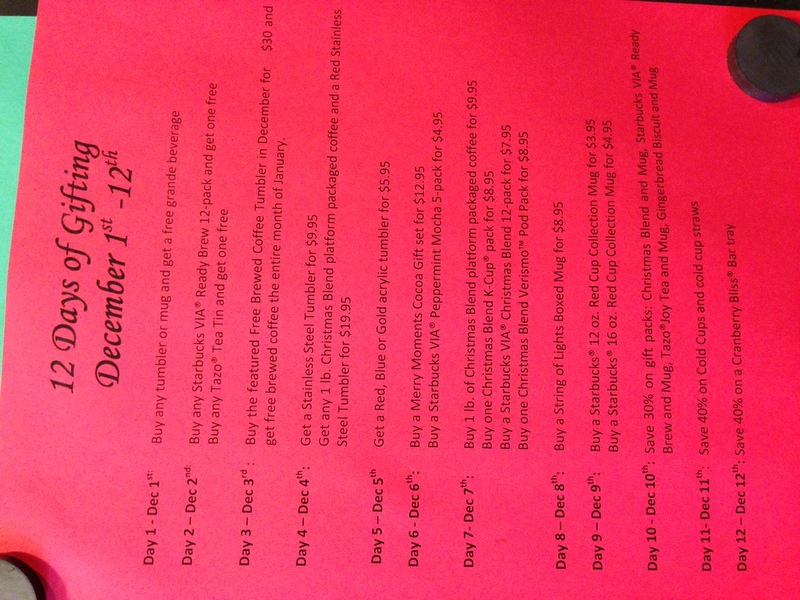 Here’s what I think is Starbucks 12 Days of Gifting for December 2012. Day 1. Buy any tumbler or mug and get a free grande beverage. Day 2. Buy any VIA Ready Brew 12-pack and get one free. Buy any Tazo Tea Tin and get one free. Day 3. Buy the featured Free Brewed Coffee Tumbler in December for $30 and get free brewed coffee the entire month of January. Day 4. Get a stainless steel tumbler for $9.95. Get any 1 lb. Christmas Blend platform packaged coffee and a Red stainless steel tumbler for $19.95. Day 5. Get a red, blue, or gold acrylic tumbler for $5.95. Day 6. Buy a Merry Moments Cocoa gift set for $12.95. Buy a VIA Peppermint Mocha 5-pack for $4.95. Day 7. Buy 1 lb. of Christmas Blend platform packaged coffee for $9.95. Buy one Christmas Blend K-Cup pack for $8.95. Buy a VIA Christmas Blend 12-pack for $7.95. Buy one Christmas Blend Verismo Pod Pack for $8.95. Day 8. Buy a String of Lights Boxed Mug for $8.95. Day 9. Buy a 12 oz. Red Cup Collection mug for $3.95. Buy a 16 oz. Red Cup Collection mug for $4.95. Day 10. Save 30% on gift packs: Christmas Blend and Mug, Starbucks VIA REady Brew and Mug, Tazo Joy Tea and Mug, Gingerbread Biscuit and Mug. Day 11. Save 40% on Cold Cups and cold cup straws. Day 12. Save 40% on a Cranberry Bliss Bar tray. Note: Reference the image above in case I had any typos. Of course, the most interesting item is the free coffee tumbler. I luckily got one in 2011 and took advantage of the deal. My only complaint is the tumbler itself. Flow of the fluid is really slow since air doesn’t vent in easily. The lid cover touches my nose when I’m drinking so I have to wipe away any coffee drops. Although a 16 oz. tumbler, its shape is tall and skinny so when in a shallow cup holder, the tumbler moves around quite a bit. I hope Starbucks fix these annoyances for this year’s tumbler.